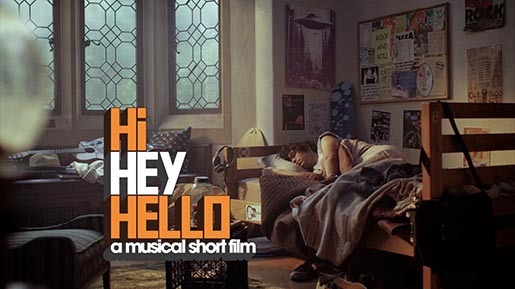 Samsung is promoting the Galaxy S4 phone’s technology with “Hi Hey Hello”, a musical short film telling the modern version of one of the most charming and universal stories known to man, boy meets girl. The music video is set on UCLA’s campus where the main character uses all the cool new features of the Samsung GALAXY S4 in his pursuit of the girl of his dreams. The goal of the video is to further introduce consumers to the Samsung GALAXY S4 smartphone and its cool features, including Dual Shot, Samsung Smart Pause, Drama Shot and Air View. The Hi Hey Hello music video campaign was developed at Leo Burnett Los Angeles by global creative director Shannon McGlothin, creative directors Brandon Rochon and Adam Kennedy, copywriter Jaysn Kim, account directors Radim Svoboda and Benjamin Haynes, assistant account executive Tom Jump Jr., executive producer Jennifer Dennis, and producer Keith Jamerson. Filming was shot by director Joseph Kahn via HSI Productions with director of photography Christopher Probst and line producer Richard Weager. Editor was Chancler Haynes at Rock Paper Scissors with assistant editor Dustin Laforece. Visual effects were produced at A52 by colorist Paul Yacono, lead Flame artist Andy Rafael Barrios, 2D artists Cameron Coombs, Enid Dalkoff, Jesse Monsour, Bruno Parenti and Matt Sousa.